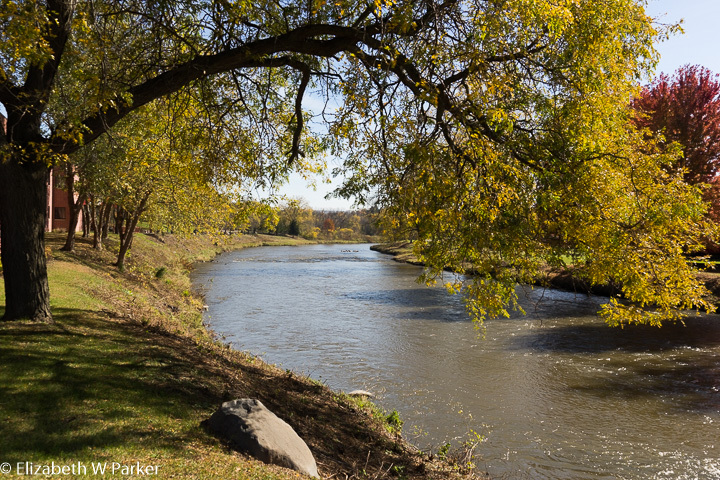 I set forth on a beautiful fall day, warmer than normal, with brilliant sunshine. The sumac and the maples lent brilliant color accents to a landscape still predominated by green and tan. It’s October; This is weather we usually see in September! Famous modern day spectacles like the Cirque du Soleil, clearly have their origins in the circuses of the last century. The circus lives on in books (and movies) like “Water For Elephants” (Sara Gruen) and “The Night Circus” (Erin Morgenstern) and, of course, “The Greatest Show on Earth” (the movie) keeping alive a fantasy lifestyle that was anything but. Baraboo is also home to the International Crane Foundation, a specialty zoo, specializing in cranes. I planned to visit both on this trip. Accompanied by a friend, we drove about an hour and a little bit north from Edgerton. It was a straight shot on I 90/39, though heavy traffic on the interstate, as always. We visited Circus World first. Outdoor display of train cars. To the right of the picture are the grounds where there are performances in the summer. I will guess that Circus World is pretty popular in the summer, but we were among just a handful of people there on a sunny Friday late in October. It was quite nice to have the place to ourselves, but because we are off-season, the actual circus act attractions are all closed for the winter. During the summer, in addition to the historic buildings and displays, you can also participate in circus shows. It must be a wonderful experience for children who will never experience, as we did, the excitement of the crowd, the communal gasps of wonder at the feats of acrobats and animals. Sadly, we were one of the last generations of children to see a show under the Big Top! Think back to a time before television, when a traveling show was a big deal, maybe the only deal, when public entertainments were limited. From small traveling troupes in the 1870s and 1880s, the circuses grew into enormous productions, mostly through consolidations, as more financially secure circuses bought up smaller rival circuses. 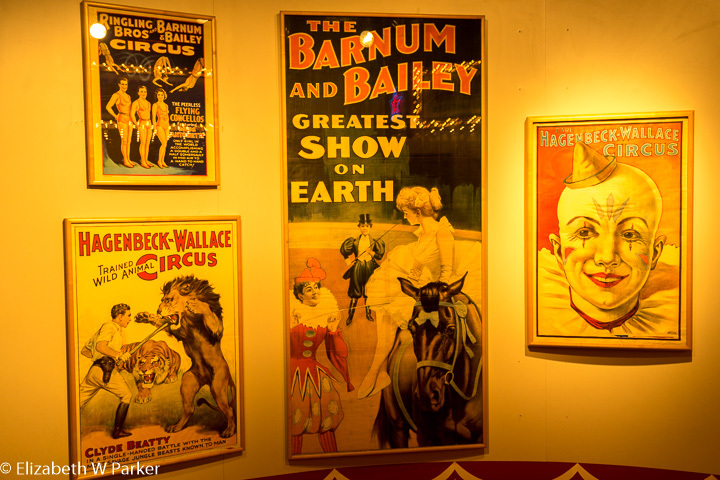 Barnum and Bailey started their circus about 13 years before the Ringling brothers started theirs, but following Bailey’s death in 1906, the Ringling Brothers bought the Barnum and Bailey Circus in 1917. The two toured separately for a few years before merging the shows into “The Greatest Show on Earth,” a moniker used by Barnum & Bailey in 1890s. Not much is presented in the museum about the final performance in 2017, but it is basically taken for granted that the loss of the elephant act, from pressure by animal rights activists, was the final nail in the circus coffin. With television and the internet, parents weren’t taking their children to see live performances and interest in the circus was already waning. 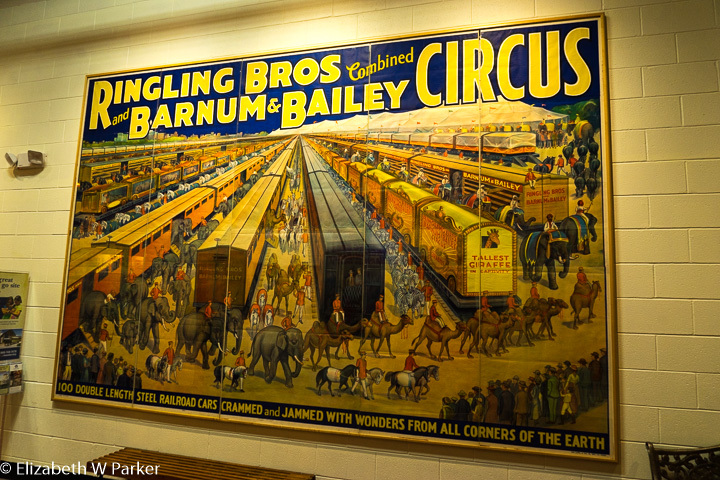 In the main hall, there is also a fascinating exhibit of circus advertising posters and through it you can trace the rise of hyperbolic phrasing for the circus acts, something that undoubtedly still spills over in to advertising today. Sample of a few of the many circus posters on display. In other buildings on the property, we saw exhibits on famous performers, and one section devoted to clowning and clowns. You can see the train car cage of the great ape (“the most terrible beast that ever lived”), the stall of the “Silver Stallion” and much more memorabilia. Though these exhibits are in historic buildings, the buildings have little left to suggest their original uses. One of the historic buildings, A stable for the horses. 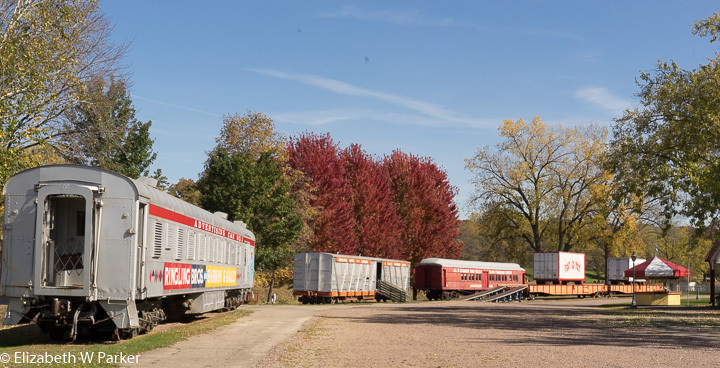 Crossing the river, you can see some of the railroad cars that moved the circus from place to place near the grounds where in the summer they have mini shows. 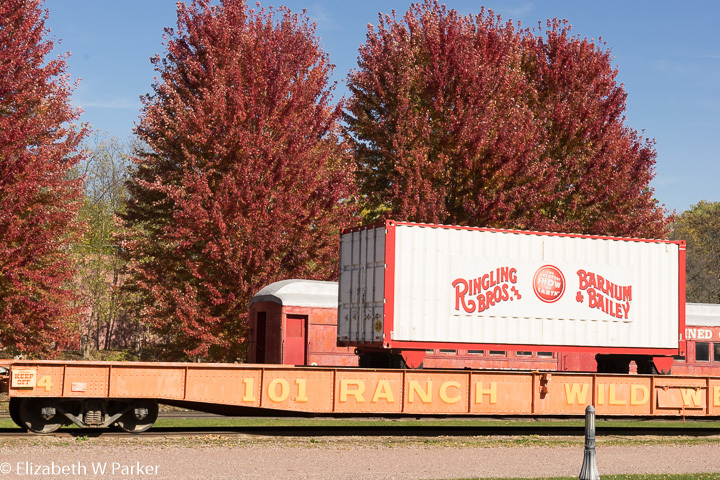 Also on that side of the river are two buildings dedicated to a collection of circus wagons and train cars. Though fascinating, the wagons and cars are all jammed into the building and it is hard to actually get a big picture (literally and figuratively) and in some cases you can’t even walk between them. From the website, it appears that they may be outside during the summer. That would be a much better way to appreciate them! A wonderful trip down memory lane, this museum is a treasure. 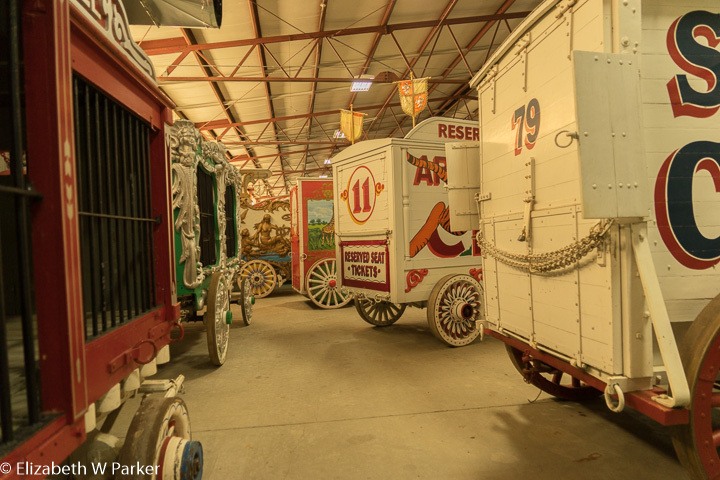 It is worth a trip to see it, and it would also be worth supporting financially, as there is so much potential in the circus wagons collection. I would like to see a much bigger display space for them even in the winter. 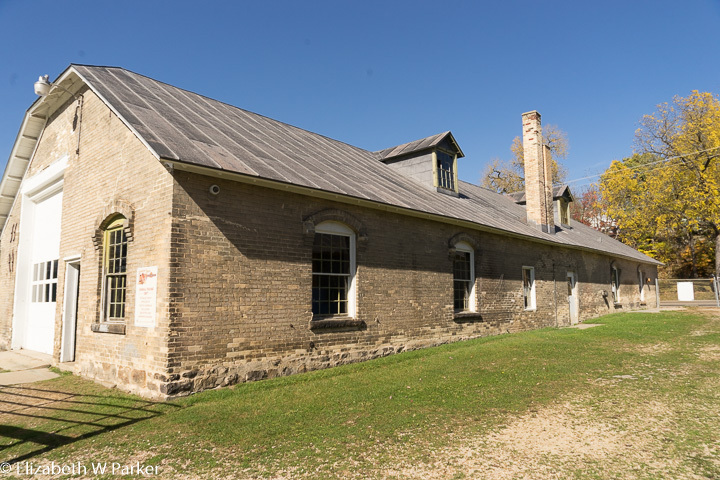 This could become an bigger draw for tourists to Baraboo. Following our immersion into the world of the circus, we entered the downtown of Baraboo and had a very tasty lunch at The Little Village Café. Seated at the counter, we could enjoy its back-in-time atmosphere and decor, as well as the food (which was very modern).